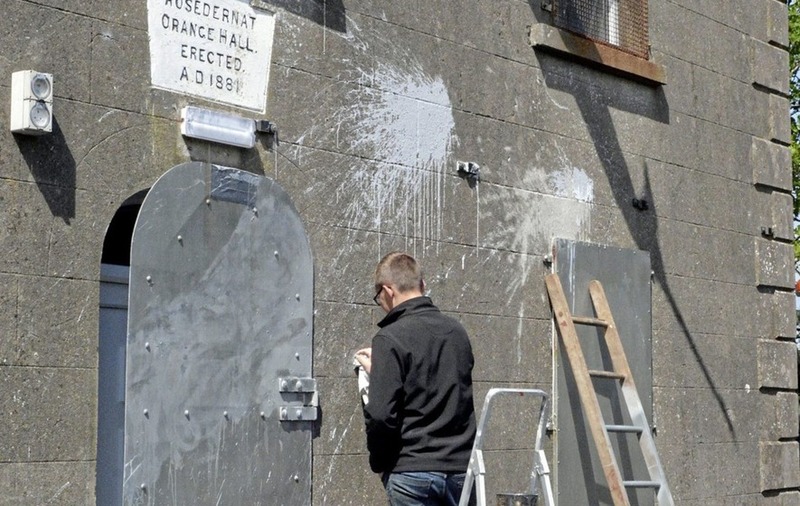 Police have described as a hate crime a paint attack on an Orange hall in Cloughmills over the weekend. Picture by Hugh Russell. Orange Hall in Cloughmills targeted in paint bomb attack. By Pacemaker Press..
Police are appealing for witnesses following a number of incidents at Orange Halls over the weekend, the eighth such attack this year. 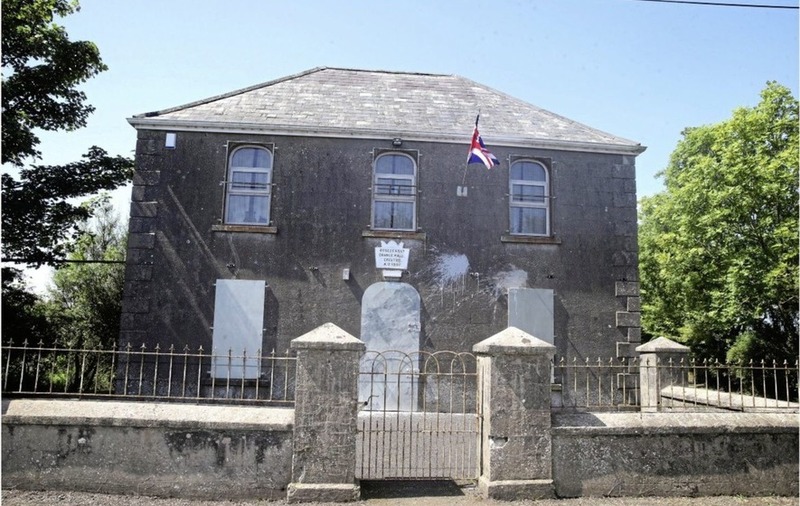 In one of the latest attacks a union flag was stolen from an Orange Hall on the Aughnahoory Road in Kilkeel sometime during the early hours of Sunday morning. Damage was caused to the flag pole during the theft. Police are also investigating the thefts of flags and damage to flag poles from a number of addresses in the area between the Manse Road and Knockchree Avenue sometime overnight Saturday night. It is thought the increase in thefts of union flags and loyalist memorabilia may be linked to controversial anti-internment bonfires which take place on August 9. A possible link between the incidents is being investigated and police are appealing to anyone with information to contact officers in Newry. Police in Ballymena are also investigating the report of criminal damage to an Orange Hall on Lislaban Road in Cloughmills over the weekend. Two paint bombs were thrown at the hall sometime between 11.30pm on Saturday and 11.30am on Sunday. A police spokesman appealed for witnesses and said they are treating the incident as "a hate crime". The Orange Order condemned those responsible for the weekend attacks. A Grand Lodge spokesman said they were " yet further examples of the intolerant sectarianism displayed by a minority who continue to manifest their hatred towards the Orange Institution, by attacking our properties on a regular basis". "Although the nature of the incidents is clearly different - the criminal intent is very much the same by the bigoted and narrow-minded individuals responsible. They have nothing to offer society, only division, and their actions must be universally condemned", the spokesperson added. North Antrim Sinn Féin MLA Philip McGuigan said; "Sectarianism is wrong no matter where its source and sectarian attacks like this paint bomb attack on Cloughmills Orange hall need to be condemned by us all. "Those responsible represent nobody and have nothing positive to offer the local North Antrim community. "Such attacks have no place in our society and need to stop. I would appeal to anyone with information on this attack to report it to the PSNI."